Great Lakes is proud to introduce the Digitus Biometrics fingerprint access control systems. It can secure any area of your data center, from the front door to the cabinet doors. 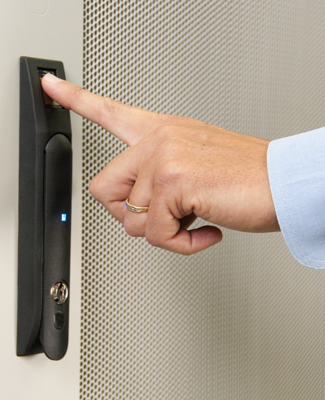 There is no need for proximity cards and gaining access is as simple as the touch of a fingertip. Digitus' proprietary biometric technology, IP networking, and advanced control software work together to deliver centralized administration, real-time monitoring and alerts, and an indisputable audit trail for every door and cabinet you choose to secure. The db BioLock handle is designed to fit the standard opening for all Great Lakes enclosures, making installation easy, seamless and "custom" for the end-user. The db BioLock handle allows each authorized user to register a second finger for use "under duress." When this alternate finger is used to gain access to the enclosure, a silent alarm is triggered to let security know the enclosure is open and something is wrong. The db ServerRack Zero-U is one of the latest product from Digitus. It offers all the same features, functions and benefits (except battery back-up) as the db ServerRack 1U, but in a more compact footprint. The control unit mounts to the inside of the cabinet wall with magnets. The db Nexus delivers biometric access control to building and room doors on the same network platform as db Server Rack. Combine db Nexus and db Server Rack solutions for unified security that covers every access point anywhere in the data center. Nexus Building/Room Access Control; Door access control with 3 point authentication via bio-metric (fingerprint), HID proximity card, and keypad. Pricing based on quantity 50. Contact your GL Rep for further sell information. GLDBNEX2C Door access control with 2 point authentication via bio-metric (fingerprint) and Keypad. Authentication can be set up for one or two point. ; Pricing based on quantity 50. Contact your GL Rep for further sell information. GLDSAI Nexus Building/Room Access Control; Room access control with bio-metric (fingerprint) authentication. Control multiple room access points from a single location; Pricing based on quantity 50. Contact your GL Rep for further sell information. GLDBADI Provides integration with Wiegand protocol devices to Digitus devices and controls; Pricing based on quantity 50. Contact your GL Rep for further sell information. Fingerprint Authentication time-stamp attendance system; Pricing based on quantity 50. Contact your GL Rep for further sell information. Single bio-metric (fingerprint) access control for IT enclosures. Includes rackmount device controller with 16 hour battery for emergency access. Pricing based on quantity 50. Contact your GL Rep for further sell information. GLDBSR2 Dual bio-metric (fingerprint) access control for IT enclosures (front and rear doors). Includes rackmount device controller with 16 hour battery for emergency access; Pricing based on quantity 50. Contact your GL Rep for further sell information. GLDBSR1ZeroU Single bio-metric (fingerprint) access control for IT enclosures. Includes Zero-U device controller; Pricing based on quantity 50. Contact your GL Rep for further sell information. GLDBSR2ZeroU Dual bio-metric (fingerprint) access control for IT enclosures (front and rear doors). Includes Zero-U device controller; Pricing based on quantity 50. Contact your GL Rep for further sell information. GLDASv5/5 Nexus and ServerRack control software, Access logs, remote unlock, user registration, 3rd party security software integration capable. 5 devices; Pricing based on quantity 50. Contact your GL Rep for further sell information. GLDASv5/10 Nexus and ServerRack control softwarem, access logs, remote unlock, user registration, 3rd party security software integration capable, 10 devices; Pricing based on quantity 50. Contact your GL Rep for further sell information. GLDASv5/25 Nexus and ServerRack control software, access logs, remote unlock, user registration, 3rd party security software integration capable, 25 devices; Pricing based on quantity 50. Contact your GL Rep for further sell information. GLDASv5/50 Nexus and ServerRack control software. Access logs, remote unlock, user registration, 3rd party security software integration capable, 50 devices; Pricing based on quantity 50. Contact your GL Rep for further sell information. GLDAS/SQL-50 Nexus and ServerRack control software with SQL backend, access logs, remote unlock, user registration capable, 50 devices; Pricing based on quantity 50. Contact your GL Rep for further sell information. For GLDAS or GLDAS/SQL software for more than 50 units, please call for more information and special pricing.